In 1987 Normandy Parish Council expressed its concern that knowledge and memories of past village life would be irretrievably lost with the demise of elderly residents, known to have been born or to have lived most of their life in Normandy. The Council together with a small group of residents who were keen to form a Local History Group met to consider how to alleviate the Council’s concern. The group launched the project to form a Society at a special Parish Meeting held in Normandy Village Hall on 18 May 1987. About 150 parishioners attended and they decided that a society be formed with terms of reference ‘to record and publish the last 100 years history of Normandy in a form acceptable to the Parish Council and for the Council to assist financially in the project’. The inaugural meeting of the Society (known as NORMANDY HISTORIANS) was held in July 1987 when a management team was elected. A formal Constitution was adopted at the Annual General Meeting held in October 1989. The logo of the Society, now affectionately known as ‘Norman’, was first used for the Wanborough Station centenary celebration held in September 1991. ‘Norman’ is a much-admired addition to the Society’s title on its letter heading and literature. He is a caricature of a warrior symbolic of all local study groups, in that he is the Defender of the past and Herald of the future. The principal object of the Society, to publish the history of the village, was achieved in July 2000 when a book was launched at an exhibition of material from the Society's archives and on-loan memorabilia. The book at a discounted price was financed by grants from the Heritage Lottery Fund, Normandy Parish Council and Guildford Borough Council and the initial print run was soon sold out. Society members have since written and published books on the prominent local houses at Normandy Park, Westwood Manor and Henley Park. Membership is only £5.00 for the year. Just download the membership form and fill it in and bring to one of our meetings with your cheque (Make your cheque payable to Normandy Historians) or post to the address on the form. 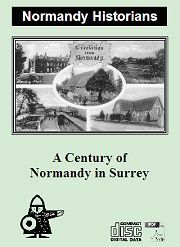 "A Century of Normandy in Surrey"
Out now the digital version of the Normandy book "A Century of Normandy in Surrey". This is a CD-Rom in PDF format and updated to "errata 7" and is available from Normandy Historians at only £7.50 plus p&p (£1.50 UK) or at our meetings. If you would prefer you can Buy it Now with "PayPal"
"A History of Normandy Park in Surrey"
A History of Normandy Park in Surrey is presented as an attractive, glossy soft-back book with cover photo, composed of 114 pages of text, 25 figures and 63 black & white photos featuring Normandy Park house, neighbouring houses and the people who helped to shape that area of Normandy including the author's family. Jack Kinder, the author demonstrates a unique and succinct style of writing, which coupled with his skill as a draughtsman, so ably demonstrated in the copious figures in the book, will not disappoint the reader. Notwithstanding the excellence of his work, A History of Normandy Park in Surrey is a veritable tome of reference for family history researchers and for those who have an interest in the transformation and development of a village as its large fruit farms and nurseries disappeared from the rural scene in the late 19th and early 20th Centuries. Available from Normandy Historians at only £9.50 plus p&p (£3.50 UK) or at our meetings. Henley Park's long history spans over a thousand years from Saxon settlement through royal ownership and more than one stately mansion to a wartime factory and its last-minute rescue from ruin and collapse. New research has revealed the much-debated location of the medieval royal complex as well as a long-forgotten Jacobean-style mansion that predates the Georgian-style mansion that we know today. This history is described in a readable and informative style in our new publication: Henley Park in Surrey, the History of a Royal Manor, by John Squier. John is an amateur historian who has lived in Normandy for 38 years and was a founder member of Normandy Historians. He has spent many years researching Henley Park since he discovered that his house was briefly part of its extensive estates. An updated history of Henley Park has long been overdue and with nearly 200 pages of text and 123 illustrations, many in colour, we believe that this is a book worthy of the long and fascinating history of Normandy's most prestigious estate. Available from Normandy Historians at only £10 plus p&p (£4.00 UK) or at our meetings.